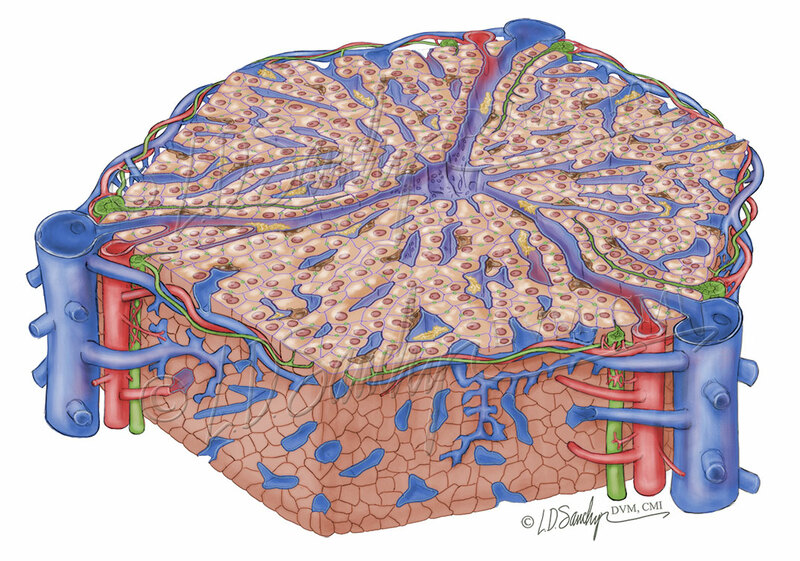 Full-color didactic illustration of the structure of the equine hepatic lobule, including hepatocytes, sinusoidal endothelial cells, Kupffer cells, Ito cells (hepatic stellate cells), space of Disse, central vein, hepatic sinusoids, bile canaliculi, flow of liver blood supply, flow of liver bile supply, and branches of the portal triad, including the hepatic portal vein, hepatic artery, and hepatic bile duct. Featured in the AAEP Frank J. Milne State-of-the-Art Lecture, “The Equine Liver in Health and Disease”, by Thomas J. Divers, DVM, DACVIM, DACVECC.